Chronicles of Narnia - Last Battle Ned Harper Collins UK "The magic of C. S. Lewis's parallel universe never fades," The Times During the last days of Narnia, the land faces its fiercest challenge-not an invader from without but an enemy from within. Lies and treachery have taken root, and only the king and a small band of loyal followers can prevent the destruction of all they hold dear in this, the magnificent ending to The Chronicles of Narnia. The Last Battle is the seventh and final book in C. S. Lewis's classic fantasy series, which has been drawing readers of all ages into a magical land with unforgettable characters for over sixty years. A complete stand-alone read, but if you want to relive the adventures and find out how it began, pick up The Magician's Nephew, the first book in The Chronicles of Narnia. Аннотация к книге "Chronicles of Narnia - Last Battle Ned"
During the last days of Narnia, the land faces its fiercest challenge-not an invader from without but an enemy from within. Lies and treachery have taken root, and only the king and a small band of loyal followers can prevent the destruction of all they hold dear in this, the magnificent ending to The Chronicles of Narnia. Издательство: Harper Collins UK, 2015 г. –27 % Выгода 82 ₽ The adventures of Tom Sawyer 2 рец. –40 % Выгода 158 ₽ Лучшие произведения Льюиса Кэрролла 7 рец. –20 % Выгода 62 ₽ Английский с Льюисом Кэрроллом. Алиса в Стране Чудес 2 рец. –20 % Выгода 66 ₽ Любимое чтение на английском языке. Кеннет Грэм. Ветер в ивах 3 рец. –20 % Выгода 66 ₽ Английские волшебные сказки 4 рец. –20 % Выгода 63 ₽ Английский язык. Ирландские волшебные сказки 3 рец. –20 % Выгода 65 ₽ Alice's Adventures in Wonderland. Книга на английском языке со словарем 1 рец. Книги автора Lewis C. S.
–40 % Выгода 244 ₽ Лев, Колдунья и Платяной шкаф 33 рец. 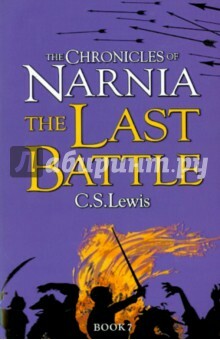 Если вы обнаружили ошибку в описании книги "Chronicles of Narnia - Last Battle Ned" (автор Lewis C. S.), пишите об этом в сообщении об ошибке. Спасибо!